Sigma Blade Mixers are engineered specifically for kneading, mixing, and homogenizing wet, pasty, and highly viscous products. The two Sigma shaped blades, which sit horizontally and parallel at the bottom of the mixing trough, provide thorough mixing. The blades rotate at different speeds in opposite directions causing the product to be transferred from blade to blade and from end to end, resulting in a figure eight pattern. Discharge of the product can be accomplished by several methods. The mixing trough can be tilted up and forward through the use of a hydraulic system. Valves can be located in the bottom of the unit, allowing the product to discharge through plug, ball, or “bomb bay” type valves. A third method, which has several advantages, is the use of an extrusion screw to pass the product directly to the next phase of processing. All double arm kneader mixers are equipped with two mixing blades placed in a W-shaped horizontal trough. Various blade profiles have evolved, each of which is best suited for a particular type of application. The commonly used blade types are the sigma blade, masticator blade, shredder blade, naben (aka fishtail) blade, and spiral blade. The rotation of the blades is either tangential to each other or the blades may overlap within the trough. The blades rotate toward each other at the same or differential speeds. The blades pass the container walls and each other at close clearances (2-3 mm) resulting in homogenous mixing. The close clearances produce very high shearing action thereby reducing any large particles. These mixers produce a consistent particle size distribution without the need for additional high speed choppers. Homogenous mixing is achieved within 10 to 30 minutes. Mixing homogeneity upto 99% and better can be achieved using the double arm kneader mixers. 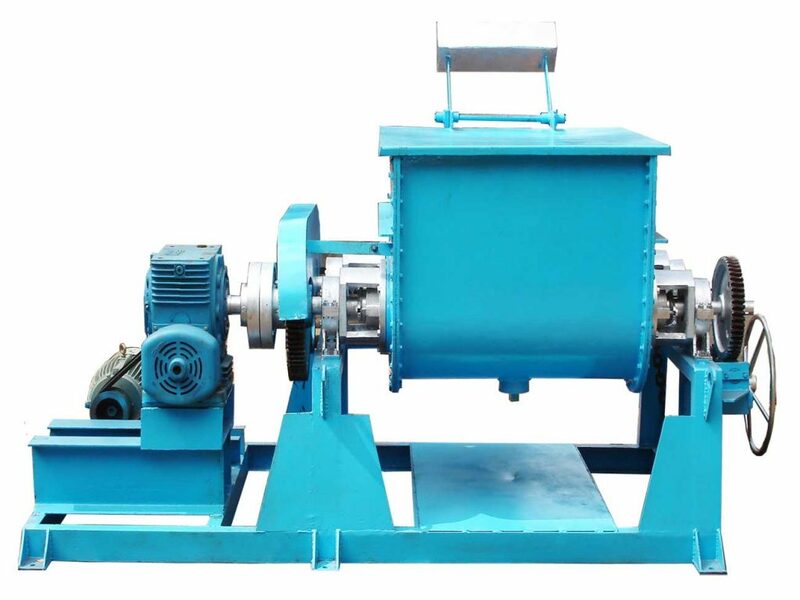 These mixers and their variants (double arm kneader mixer extruders) are capable of handling material with viscosities as high as 10 million centipoises. The power consumption in double arm kneader mixer is very high compared to other types of mixers and can range from 45 to 75 kW/m3 of mix material. The sigma blade mixer is the most commonly used type of double arm kneader mixer, and is best suited for all round use. In mixers handling very viscous materials, it is necessary to promote both lateral and transverse motion of the material. The geometry and profile of the sigma blade is designed such that the viscous mass of material is pulled, sheared, compressed, kneaded, and folded by the action of the blades against the walls of the mixer trough. The extent to which this happens depends on the action of the blades – tangential or overlapping and the ratio of the speed of rotation of the blades.The helix angle of the blade can be modified depending on the required shearing. In the tangential design, the blades rotate in the trough meeting tangentially as shown in figure 2. The front blade generally rotates faster than the rear blade usually in the ratio of 3:2. Tangential blades are generally used for material of higher viscosities such as adhesives, rubber compounds, flush colors, dyes, and pigments. In the overlapping design, the blades overlap above the saddle of the container. The overlapping blade configuration is shown in figure 3. Due to the overlapping action it is necessary that the relative position of the two blades is unchanged, and as a result, both the blades rotate at the same speed. Materials that flow freely or creep down into the blades are mixed using the overlapping blade action. This design offers a faster interchange of material from one blade compartment of the mixer to the other. Overlapping blade action is used for materials of lighter viscosities such as carbon pastes, clay coating, creams, and ointments. The overlapping blade produces a lower kneading and shearing compared to the tangential blade action. In operation, material is loaded through the top of the container to typically 40 to 65 percent of the mixer’s total volumetric capacity. The rotation of the blades is through heavy duty drive systems typically consisting of a motor, gearbox, couplings, and gears. tip speed of the sigma mixer is generally limited to 60 metres per minute. Mixing may be carried out at ambient temperature or under controlled temperature conditions. The mixer troughs can be provided with jackets for circulation of hot or cold media to maintain the required temperature conditions within the mixer. The discharge of the material from the mixer container is either by tilting of the mixer container (see figure 4), bottom discharge valve (see figure 5), or through an extruder / screw located in the lower portion between the two trough compartments (see figure 6).The mixer may be equipped with any one of these discharge arrangements. The tilting discharge arrangement is most common. The tilting arrangement of the container may be designed for manual operation or may be mechanized using motorized or hydraulic arrangement.